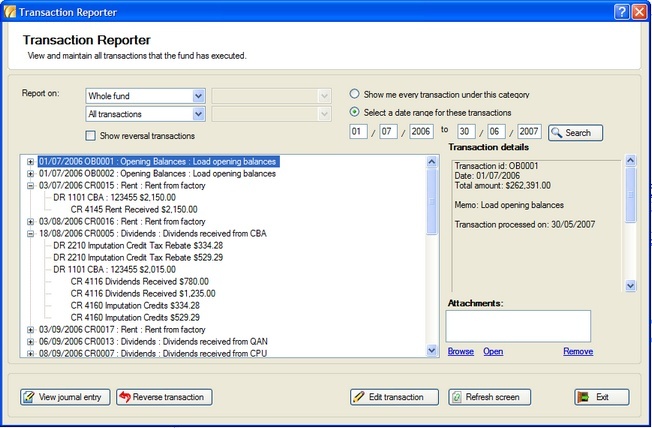 The transaction reporter screen shows you all of the transactions that have been processed for your fund. This includes transactions which were processed manually and those that were generated automatically. It is a good place to look when you say to yourself: “I know I entered it, I just can’t find it”. 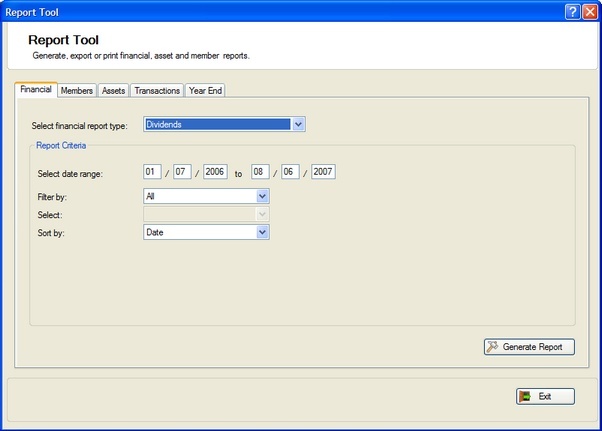 This screen reporter screen enables you to quickly and easily find, view, edit or reverse transactions. In the case of transactions where there are additional details included (such as a dividend) you can also access those additional details. Because transactions are never deleted, only reversed, MySF Manager is capable of maintaining a full audit trail. 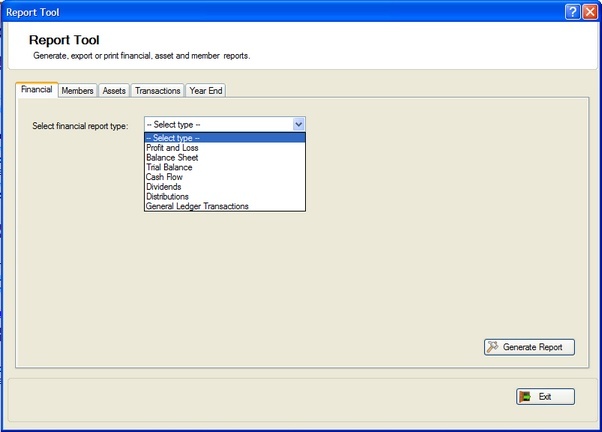 Reversed transactions are not shown on most reports, but can be accessed by ticking the “show reversed transactions” checkbox and are useful when identifying any input errors. 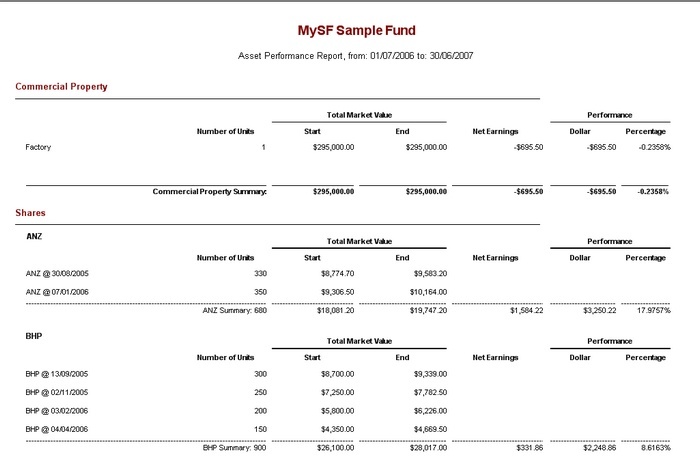 MySF Manager includes a comprehensive report generator which enables you to create any of the huge number of financial, asset and member reports. These reports can be prepared for any selected date or date range and notes to accounts may be included. The notes themselves may be edited and you may choose to attach different notes. Many of the reports can be customised so that the level of detail shown is suitable for the reports purpose. Some of the reports can also be filtered to include information only about a specific asset class rather than the entire fund. Asset reports can be filtered by type (financial / physical) or by asset class and you can also select which date or date range you would like to see in the report. The purpose of these reports is not only to assist with compliance and taxation but also to keep you informed about your investments and make you better informed. The investment strategy review enables you to quickly and easily compare your actual investments against the investment strategy you have defined. This screen will show you the required information in a chart and also as a data table. The yield analysis features enables you to see the yield that has been earned by your fund or a selected subset of assets within your fund. You can view yields for a single selection or you can compare the yield of multiple subsets of assets within your fund. The income and expense analysis feature was added to MySF Manager with the 3.0.0 upgrade. This feature shows you a breakdown of the income received and expenses incurred by your fund, separating the entries by source or account. A pie chart is used to show the relative amounts in each category. The market value analysis screen enables you to check the changes in the market value of your fund’s investments. As a unique feature for MySF Manager we have even added a facility to enable you to benchmark your performance against any Australian code or index, such as the All Ordinaries. 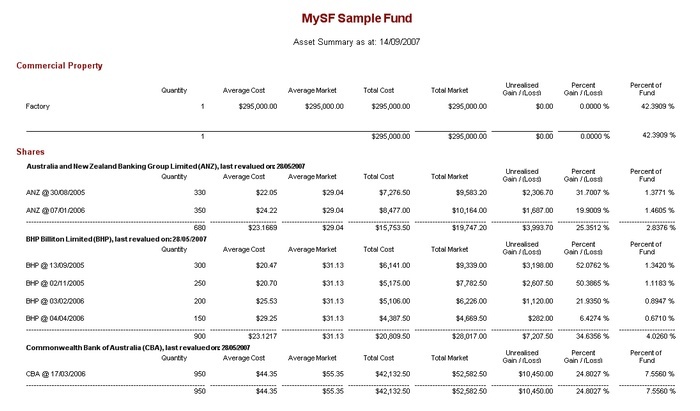 This analysis can also be performed for the whole fund or a subset of assets. Additionally you can opt to display groups of assets separately, allowing you to compare the market value changes between them. 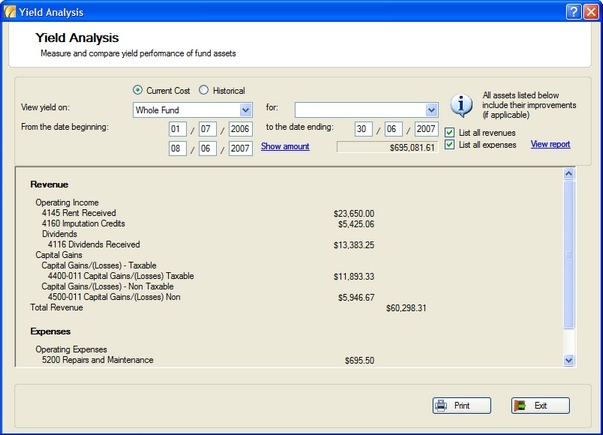 This is a professional portfolio management level feature which is not available in any other SMSF software products.